If there’s any lesson to be learnt from the new play A Thousand Murdered Girls, about the way that Greek women partisans were treated after the Second World War, it’s don’t trust the British. Partisan movements, very often led by strong Communist parties, were fundamental in liberating many of the countries in the Balkan region. And it was in those Communist led resistance armies that you would have found a considerable number of women, not just in support roles to the army, but actually taking up arms and fighting side by side with the men for the liberation of their countries from Fascism. 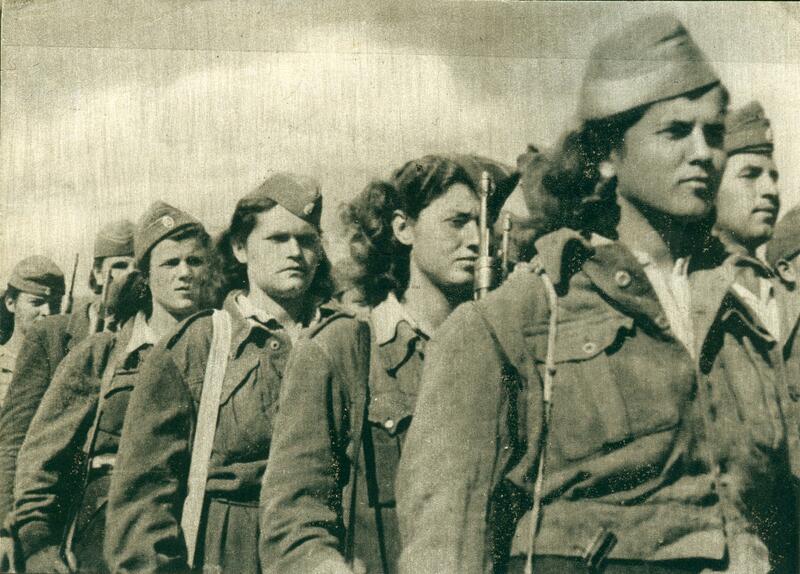 In fact, it was only in those countries where the Communists were organised that women played such a militant role: Albania, Greece, Yugoslavia and the Soviet Union. The British supplied arms (after all for much of the war the British weren’t actually doing much fighting in Europe) and constantly tried to influence those Partisan movements by sending in Special Operations Executive (SOE) officers, the forerunner of MI6. At the same time that the Soviet Red Army was inflicting crushing blows on the German Nazi forces on the Eastern Front both German and Italian forces were being pushed out of those countries in southern Europe that they had taken with such ease a few years before. Royalist and very often pro-fascist armies of the old state had put up little resistance and it was only when the Communist Partisans became properly organised that the tide began to turn against Fascism. By the autumn of 1944, when the defeat of the Nazis was only a matter of time, the British, and especially Churchill, started to denigrate and sideline these fighters, who had sacrificed so much, in favour of political forces that would be more willing to follow the instructions of the both the UK and the USA. Churchill might have been anti-Nazi but he was never anti-Fascist! So as soon as the war was ‘won’ in Greece the Greek people had to face the attempts of the local Monarchists and Fascists to reap the rewards of all their suffering and sacrifice. Mistakes made by the Greek Communist Party (the KKE) led to a drawn out Civil War which they eventually lost. If one major mistake was to trust the British the other was to give up their arms. No revolutionary, in any country, in any circumstance, should ever, ever give up their arms just on the promises made by government and international forces that have spent their existence perfecting the art of lying to the people. Unfortunately the Greek Partisans didn’t seem to be aware of events in Germany in the 1920s or any understanding of the extent to which imperialism would go in their attempts to destroy the young Soviet Union. If the Greeks made a fatal mistake (for some) in the 1940s it’s even more depressing to look at what has happened in the last few years in Nepal. Why the KKE made such a mistake I can’t say although the evidence of the nefarious actions of the British were evident in the region – witness the Corfu Channel Incident engineered by the British (which even meant the deaths of their own seamen) in an attempt to intimidate Albania. The Communist Party in Albania was strong enough, and probably had a better ideological understanding of what was happening in the immediate post-war world, to stand up to such bullying. The play makes a point, quite early, about what Churchill was up to and that’s all well and good. What it does not mention is that it was not a party political issue in the UK. If Churchill started the process of interference in the internal affairs of the Balkan countries it was the Labour Government of Attlee (with Bevin as the anti-Communist Foreign Secretary) who continued with the policy, even moving British involvement up a notch. One of the problems in Britain, and this comes up in many so-called progressive artistic performances as well, is that there is a seeming reluctance of many of those on the ‘left’ of any criticism of the Labour Party and its foreign policy. Labour was thrown out (and Churchill returned) before the action in the play is completed but there is a seamless development of foreign policy. This was to be repeated the next time the Labour Party were to find themselves in power in Britain, and for that millions of Indonesian working people and peasants were to suffer. Through representing this shameful period in Greek history (which led directly to the fascistisation of the Greek police and military and ultimately to the Generals Coup in 1967) through the words that the women wrote whilst in concentration camps on the small and, at that time, isolated island of Trikeri it misses the most important point. Yes it displays their strength, unity and steadfastness in face of extreme suffering, hardship and provocation. But in the end it doesn’t try to present us with any useful thoughts for the future. The play A Thousand Murdered Girls was written by Darren Guy, directed by Mikyla Jane Durkan and performed at the Unity Theatre, Liverpool, from the 4th-6th July, 2013. This entry was posted in Play Reviews and tagged concentration camp, EAM, ELAS, fascism, greek civil war, KKE, partisan, women by Michael. Bookmark the permalink.